Did George Bush Really Write That Book About His Father? All over the country, newspaper reviewers are wasting space reviewing George Bush's biography about his father. Whether they pan it or praise it, they'll say over and over, as Michiko Kakutani recently did in The New York Times, things like "he writes--" or "he says--"
I reviewed for the The Detroit Free Press, The Washington Post, The Jerusalem Report and other print outlets for well over a decade, but I avoided celebrity-authored bios or memoirs for a simple reason. They were almost never written by the "authors," but compiled from tape recorded interviews, ramblings, or notes and written by a professional ghost writer. I learned this early on in my own publishing career when one writer friend told me she had been asked to do a best selling author's memoir, and another told me what he was ghosting. In my view, when reviewers pretend that's not happening, they makes themselves complicit in the fiction that these celebrities have actually written the book that flaunts their name, a book they've gotten huge advances for. Bush wrote a book about his father? Have people forgotten what a juvenile attitude this man has about books? Back when he was President, he and his senior advisor Karl Rove acted liked they were in elementary school, competing with each other to see who could read more books per year. Bush won, of course, supposedly reading ninety-five books yearly for three years straight, which is close to what I used to read as a professional reviewer. And of course his consigliere swore that Bush "loves books, learns from them, and is intellectually engaged by them." Truly engaged readers can't stop talking about books they enjoy, and sometimes even books they dislike. But given his love of books, it's strange that nobody ever reported Bush discussing a book with them, anywhere. At meetings of world leaders, the President was widely known to chat only about his colleagues' flights and if they were able to sleep on the plane. He never brought up books that he supposedly had read (like Team of Rivals) when that would have been a perfect opportunity, especially if his favorite topics were supposedly history and biography. So the only proof we had that he was reading steadily was testimony from his personal friend Karl Rove, just as the only proof we have that he wrote this new book is his name on the cover. But the saddest part of the book race Bush ran with his crony was that reading sounded like a real burden, otherwise why compete in the first place, and in such a bizarre way? Rove reported that "We kept track not just of books read, but also the number of pages and later the combined size of each book's pages--its 'Total Lateral Area.' 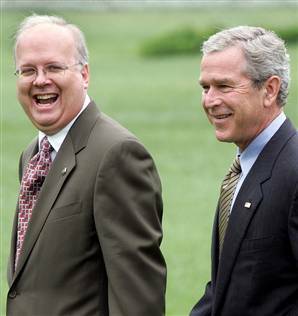 " So the number and size of pages apparently meant as much to Rove and Bush as what was on them. Maybe more? The book in question, 41: A Portrait of My Father, is only 304 pages with the Acknowledgments and Index starting on p. 277. Physically it's on the smaller side for a political hardcover: 5.8 x 1.1 x 8.5 inches. By their own strange standard, this new book doesn't score very high, does it? As for Mr. Bush's descriptions of the West Texas world that greeted him and his parents in the 1950s, they are evocative in a way that attests to his painterly eye. "We lived briefly at a hotel and then moved into a new 847-square-foot house on the outskirts of town," he recalls. "The neighborhood was called Easter Egg Row, because the developers had chosen vibrant paint colors to help residents tell the houses apart. Our Easter egg at 405 East Maple was bright blue." Really? That's what one of the country's most influential book reviewers calls evocative writing? You have to have a painterly eye to notice the colors of the houses around you? And how is Bush being "evocative" if the image was handed to him by the neighborhood's actual name? He's just reporting what was there. Lev Raphael's 25th book, Assault With a Deadly Lie, is a novel of suspense about stalking, gun violence, and militarized police. You can check out his other books here.